Are you the owner of a new build? Looking to refurbish your business or remodel your home? Pay close attention as some efficiency claims are not quite what they seem. Make sure you check your bill when it comes in and see if it sounds reasonable against your actual energy usage - anything alarming should be reported straight away to your supplier. There may be an issue with your bill, an incorrect meter reading provided, or your home is not as efficient as claimed when you purchased. A study carried out by Bath University has uncovered statistics which highlight how the lack of follow up regulations mean that energy efficient buildings are failing their occupants. What is known in the industry as the 'performance gap' covers the difference between what a building is predicted to use and what it actually uses once the occupants have moved in. Our buildings in Britain account for almost half of the country's greenhouse gas emmissions and the study proposes this could be cut if buildings act as they are predicted to. 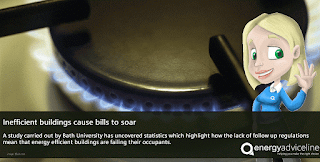 After interviewing a series of building modellers it was found that they were unable to agree on what aspects of the building are most useful for energy efficiency, and what impact they actually make on the total of a bill each month or year. The UK's Green Building Council has called for a method of certifying buildings that falls in line with the current certificates that we recognise for our electric appliances. This is currently not a legal obligation but could be something required in the future.